Sean Spicer told “Fox & Friends” viewers that Donald Trump was not a “cartoon president,” which was said in response to a New York Times piece where Barack Obama expressed his doubts about his successor. “No, I did not work for a cartoon president,” the former White House press secretary told the cast on the Fox News morning show. The Times piece spoke at length of President Obama’s mental state in the weeks following Trump’s victory over Hillary Clinton in the 2016 presidential election. The story, which was written by Peter Baker, described Obama’s feelings on Trump’s win and its aftermath, which was described in a new book by longtime Obama aide Benjamin Rhodes. “I think it’s ironic that Hillary Clinton was the master of trying to blame everybody for the election loss and now they’re getting in on the act of who else to blame,” he laughed. White House press secretary Sean Spicer stepped down on Friday, leaving behind a legacy of frequent errors, outright lies and a stellar impersonation by Melissa McCarthy. Jan. 21: In his debut as White House press secretary, Spicer slammed the "dishonest" media for lying about the size of the crowds at Trump's inauguration. He would go on to falsely state that it was the "largest audience to ever witness an inauguration, period." Jan. 23: After Spicer's combative first press conference, New York magazine's The Cut dug up a seemingly small detail from an August 2016 profile of Spicer in the Washington Post: Spicer chews two and a half packs of Orbit cinnamon gum by noon, all of which he swallows whole. Jan. 26: Spicer confounded Twitter users in January with a pair mysterious tweets on consecutive mornings that still have not been explained. Some have speculated that the random strings of characters, "Aqenbpuu" and "n9y25ah7," could be mistakenly tweeted-out passwords. Feb. 4: Melissa McCarthy earned an Emmy nomination for her impression of Spicer on "Saturday Night Live," a brash, gut-busting impression that's likely to endure in the collective American memory longer than Spicer's actual performance as press secretary. March 10: Spicer showed up to an on-camera press briefing with his American flag lapel pin turned upside-down, traditionally a signal of distress. The gaffe also earned a shoutout from Netflix's "House of Cards," which uses an upturned flag as its logo. March 17: In celebration of St. Patrick's Day, Spicer wore a solid green tie to a press briefing in March, all but asking internet users to give him the greenscreen treatment. Social media took the challenge and ran with it, superimposing all kinds of video footage onto his chest. March 28: Spicer got into a terse exchange with veteran White House correspondent April Ryan over the Trump administration's various Russia scandals. He grew frustrated as he repeatedly denied all the allegations, before snapping and instructing her to "stop shaking your head." 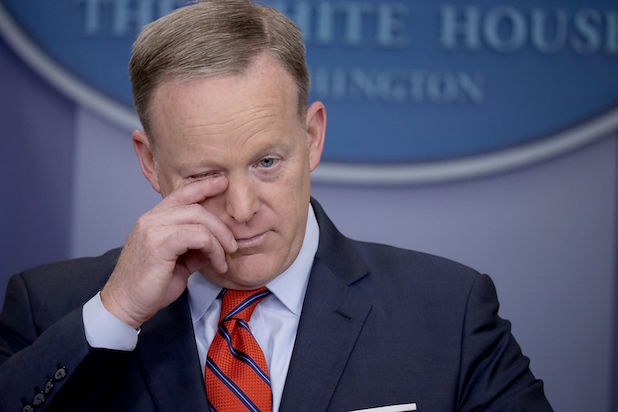 April 11: While discussing the use of chemical weapons by the Syrian government, Spicer drew outrage when he said, "You know, you had someone as despicable as Hitler who didn't even sink to using chemical weapons." Given the opportunity to clarify, Spicer mistakenly referred to Nazi death camps as "Holocaust centers," making his predicament even worse. May 10: Spicer and his team scrambled to deal with the press when Trump surprised the country by firing FBI Director James Comey amid an ongoing investigation into the president's ties to Russia. The Washington Post later reported that Spicer "spent several minutes hidden in the bushes" preparing before agreeing to only take questions in complete darkness. May 24: During the President's highly publicized trip to Europe and the Middle East, a few White House staffers got the opportunity to meet with Pope Francis at the Vatican. One person who didn't make the cut: Devout Catholic Sean Spicer. May 31: President Trump's late-night tweet decrying "negative press covfefe" set the internet on fire with its obvious typo, but by the next morning Spicer was telling reporters the whole thing was intentional. "I think the president and a small group of people know exactly what he meant," he said. Bonus: Years before his short tenure as press secretary for the Trump Administration, Spicer held a different position under President Bush -- Easter Bunny at the White House Egg Roll.